Nicolas Pernigotti provides a detailed tactical analysis of the Club World Cup final with finished River Plate 0-3 Barcelona. In Yokohama, the final of the FIFA World Club Championship, saw on one hand the champion of the Copa Libertadores River Plate, who had beaten in the semifinals Sanfrecce Hiroshima of Japan, and on the other the Champions League winners, FC Barcelona that without Messi and Neymar beat Chinese team Guangzhou Evergrande. In the end, the Spanish team had their South American trident, as both Messi and Neymar decided to play the game despite not being 100%. River Plate made one change from the team that played the semifinal, with Uruguayan Tabaré Viudez replacing Leonardo Pisculichi. 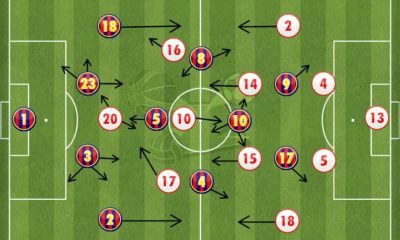 Luis Enrique presented his classic 4-3-3 system, River Plate alternated between their usual 4-3-1-2 and 4-4-2, the two systems being used by the team of Marcelo Gallardo. RIVER PLATE: BAROVERO; MERCADO, MAIDANA, BALANTA, VANGIONI; KRANEVITTER, SÁNCHEZ, VIUDEZ (DRIUSSI, MIN. 56), PONZIO (GONZÁLEZ, MIN. 45); MORA (MARTÍNEZ, MIN. 45), ALARIO. FC BARCELONA: BRAVO; DANI ALVES, PIQUÉ, MASCHERANO (VERMAELEN, MIN. 81), JORDI ALBA; BUSQUETS, RAKITIC (SERGI ROBERTO, MIN. 67), INIESTA; MESSI, NEYMAR (MATHIEU, MIN. 89), SUÁREZ. Goals: 0-1, MIN. 36, MESSI. 0-2, MIN. 48, LUIS SUÁREZ. 0-3, MIN. 68, LUIS SUÁREZ. Yellow Cards: KRANEVITTER (MIN. 10), JORDI ALBA (MIN. 16), PONZIO (MIN. 32), RAKITIC (MIN. 43), NEYMAR (MIN. 61) Y SERGI ROBERTO (MIN. 72). 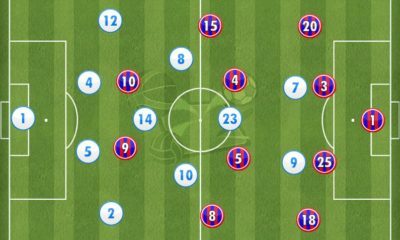 In the first minutes, River Plate chose to exercise a suffocating full field pressure, pressuring the centre-backs, Pique and Mascherano, especially covering the possible play on the wings. The Argentine team tried to cut out the possible connections associated with Barça’s build up play. A similar approach has been adopted by two teams against the Catalan team, Valencia in La Liga and Juventus in the Champions League, both without success, but anyway both teams generated problems for Luis Enrique´s team. Gallardo, probably after examining the tapes, decided to adopt this tactical game, seeking to prevent the free flowing game of Barcelona. In a deeper analysis we can say that the two strikers pressuring the central defenders would lead to blocking of the passing lanes to Rakitić, Busquets and Iniesta. In theory, it seemed to be a good idea but the central defenders of Barcelona dragged the forwards out wide which left Busquets free, through whom the first line of South American team pressure was bypassed, rendering the pressing ineffective. Ponzio tried to cover Busquets, but this was not a simple function, as the free movement of Neymar and Messi also required special attention. This combined with Iniesta and Busquets or Rakitić’s skill on the ball broke the defensive system of River Plate. 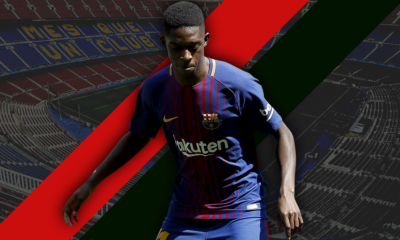 After the first 15 minutes of the match, River were forced to change to a 4-4-2 with medium pressure, looking to defend in a block, controlling Barcelona midfielders. River Plate could do little offensively, and were unable to faze the Barça defense. The best incursions of La Banda were down the right side of attack, with Sánchez and Mora in search of Alario in the area, but nothing that hurt the Spanish team. A counter-pressing Barça was simply too much for River as the likes of Busquets dominated the game. It was through counter-pressing that Barça scored the first goal. Neymar lost the ball on the wing, but was supported by Alba, who forced an error from Mercado and won the ball immediately. Here was the classic game of Barça, Dani Alves’ cross found Neymar who set-up Messi for the opening goal of the game. Showing a rapid transition from “recovery-attack” that caught out River Plate. The second half began much like the first, with River trying to pressure in zone 1. Gallardo’s team went onto the field with two new names in Gonzalo Martinez and Lucho González replacing Mora and Ponzio respectively. This changed the scheme to a 4-3-3 as Martinez joined Alario and Viudez as attackers. 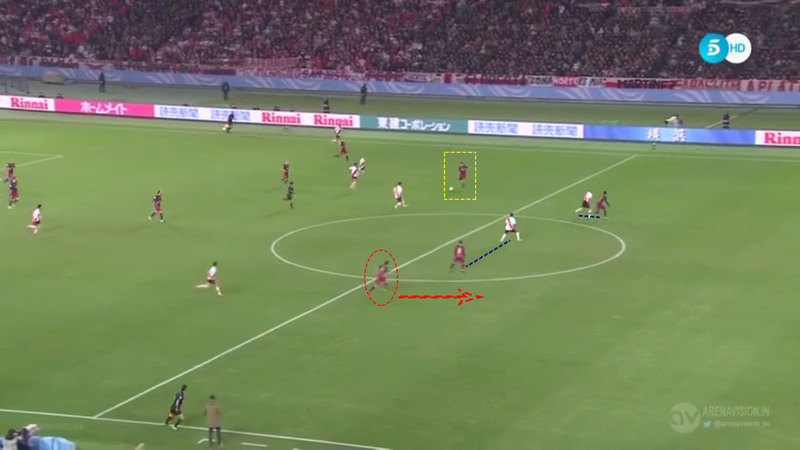 This move left the midfield vulnerable, allowing Barcelona to play 3 on 3 in the middle, which was fatal for River. 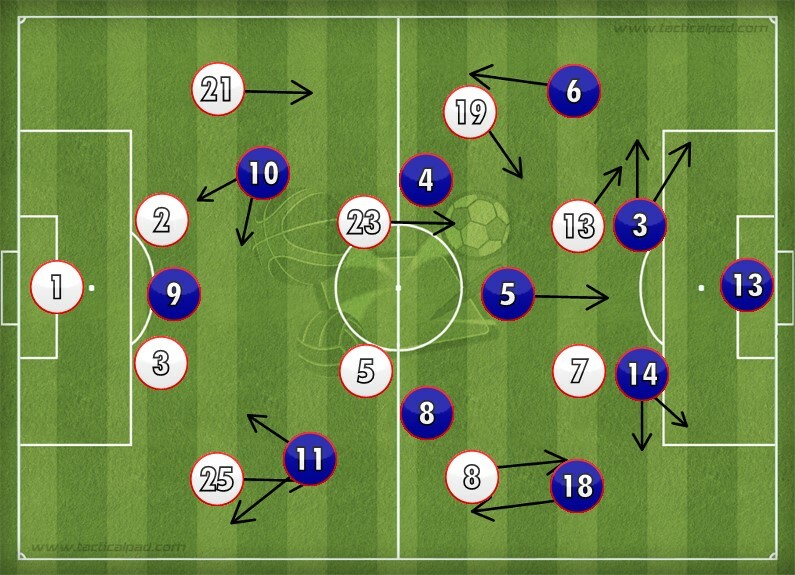 Although River kept attacking in a 4-4-2 shape, with advanced defenders to generate a supposed numerical advantage against attackers of the culés. In the next image we see how Messi (Red Square) and Jordi Alba are positioned to take their opponents by surprise. River tried to keep Barça’s attack quiet but without success. The difference in talent of the players made River’s task nearly impossible. River often exposed themselves to a 3 versus 2 in defense, a great mistake which spelt the end for the South American team. There is no way that the South American team could neutralize the Catalan midfield, and the game was monopolized by the Champions of Spain with superiority in all sectors of the field. They created multiple goal scoring situations, and the second goal was the beginning of the end for the Argentines. 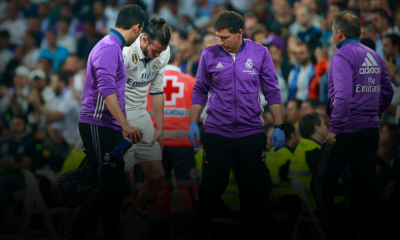 Barcelona played the high quality football to which we are accustomed, plus the technical differences of the players on either roster, meant that River struggled to cause any discomfort to the Chilean goalkeeper. The closest River came to success in attack was a shot off the post by G. Martinez, 5 minutes from the final whistle, and with the score already 3-0. All said and done, it was a decent performance from River Plate, considering the opponent they faced, one of the best teams of all time. 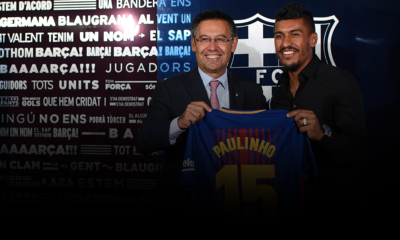 Perhaps some blame can be attached to Gallardo’s tactical errors or changes, but the fact is that Barcelona were superior and little could be done about that. Note that since the victory in the Libertadores Cup in August, the team has been in decline, and have been eliminated from the South American Cup by Huracan. Barcelona will try to keep winning everything in its path, with a repeat the Champions League the crowning glory. A great team along with a coach who evolves in his ideas is certainly a successful cocktail whichever way you look at it.